itch.io has a great system for giving free copies of your game called download keys. There are a couple shortcomings with it though: the system only lets you create 1 key at a time, doesn’t give you control over what specific files are available, and whether external marketplace keys are available. Often when running a promotion by handing out keys you’ll need hundreds or maybe thousands of keys available to distribute. If you’re doing a Kickstarter you might need to generate different sets of keys for the different backer levels that give access to the respective files. Now it’s really easy to do all of that. 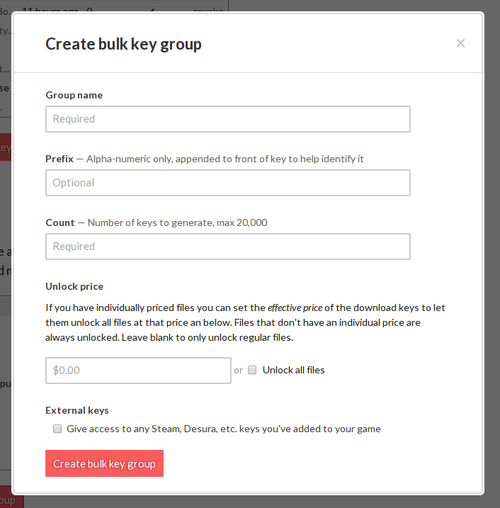 Starting today there’s a new Bulk Keys section on a game’s Download Keys tab. In order to create a large amount of keys you create a bulk key group, a collection of keys that all share some common parameters. You can create up to 20,000 keys at once. You can set the effective price of the generated keys to control whether certain individual priced files are available. You can also control whether any external marketplace keys are available to be claimed*. After creating a key group you can download the entire list of URLs in a single text file ready for uploading or printing. The generated download keys use a subset of characters that are easily distinguishable, so they make good candidates for printing out. Eg. l and I are often ambiguous when printed, so they aren’t used for keys. From the Download Keys tab you can keep track of the groups you’ve created and see how many keys in a group have been claimed. * Be careful about allowing external marketplace keys. 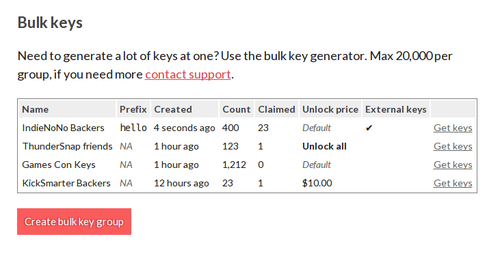 If the external marketplace key on the respective site gives an itch.io key then it might be possible for someone with a single key to keep claiming as many keys as they want!